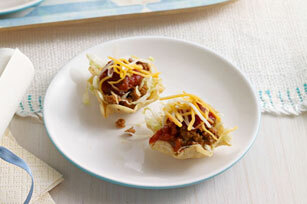 These tasty little taco salad appetizers will put some cheesy fun in your next get-together. Scooped tortilla chips make terrific mini taco salad bowls in our Mini Taco Salad Appetizers recipe. Brown meat in medium skillet; drain. Return meat to skillet. Stir in 1/3 cup salsa; simmer 10 min., stirring occasionally. Arrange chips in single layer on platter; fill with lettuce, meat mixture, remaining salsa and cheese. Garnish with thinly sliced green onions or chopped fresh cilantro just before serving.